I can’t stop leafing through Janet’s retro cookbooks that we used to plan the menu of her 1960s-themed birthday bash. Some recipes, like Red Tomato Mold, are not all that appealing. And others, namely Tutti-Frutti Tortoni, and Po Po, will make you laugh. But these little party animals are sure to grab your heart. 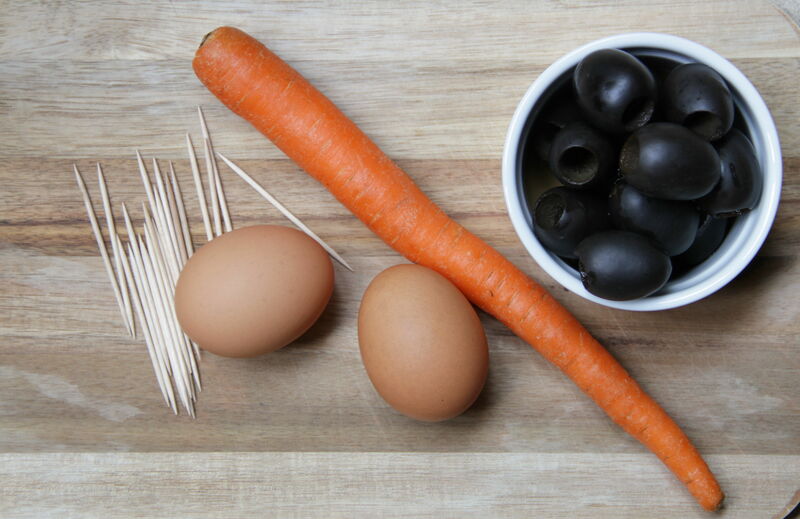 You only need a couple of hard-boiled eggs, a carrot, a few black olives and a handful of toothpicks. 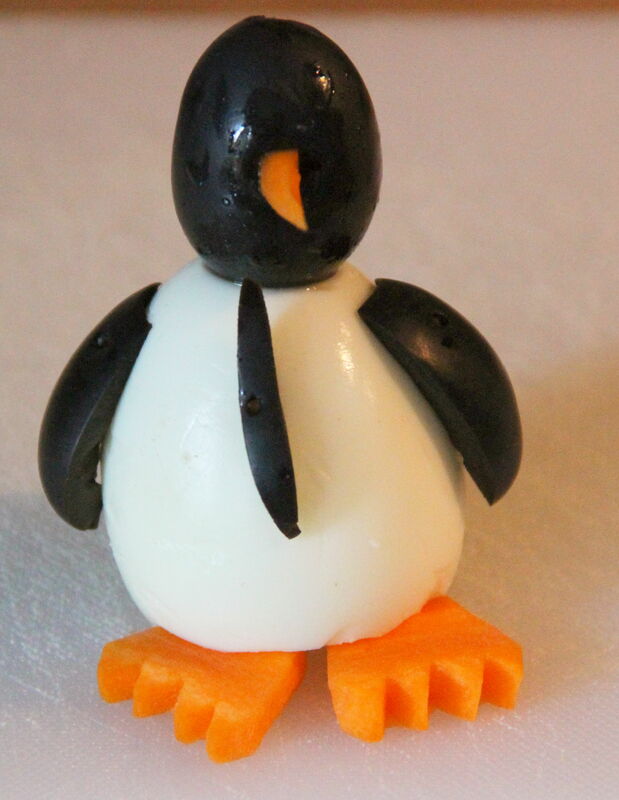 If you have some kids around to help you assemble these adorable little egg penguins, even better. If you need to make more, just throw a few extra eggs in the pot. Then, use your cute egguins to dress up a party platter, add cheer to a plate of deviled eggs, or become the centerpiece of a breakfast tray for a heart-warming, retro breakfast in bed. WARNING! 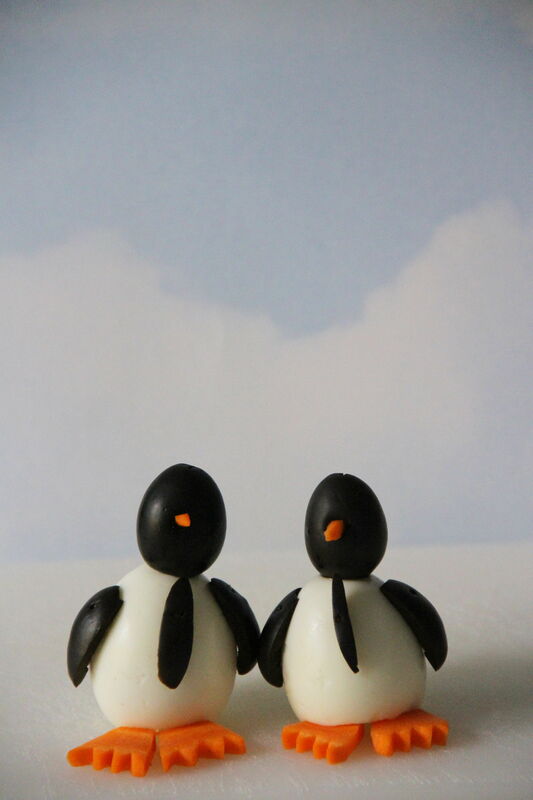 : You may come away hungry as some find these little guys too cute to eat. Place eggs in small heavy saucepan and cover with water. Bring to a boil on high heat and cook for one minute or so. Turn off heat, and let eggs remain in hot water for 10 minutes, until hard-boiled. Immerse in cold water and carefully peel eggs. Allow to cool thoroughly before assembling. When ready to assemble, cut a thin slice from the large end of each peeled egg, just enough so each egg can stand levelly. Peel carrot, and cut a long ¼-inch thick slice lengthwise. Cut 4 “feet,” each approximately ¾-inch wide in front and tapered to about ½-inch in the back. Use a paring knife to notch some “toes” in the front. 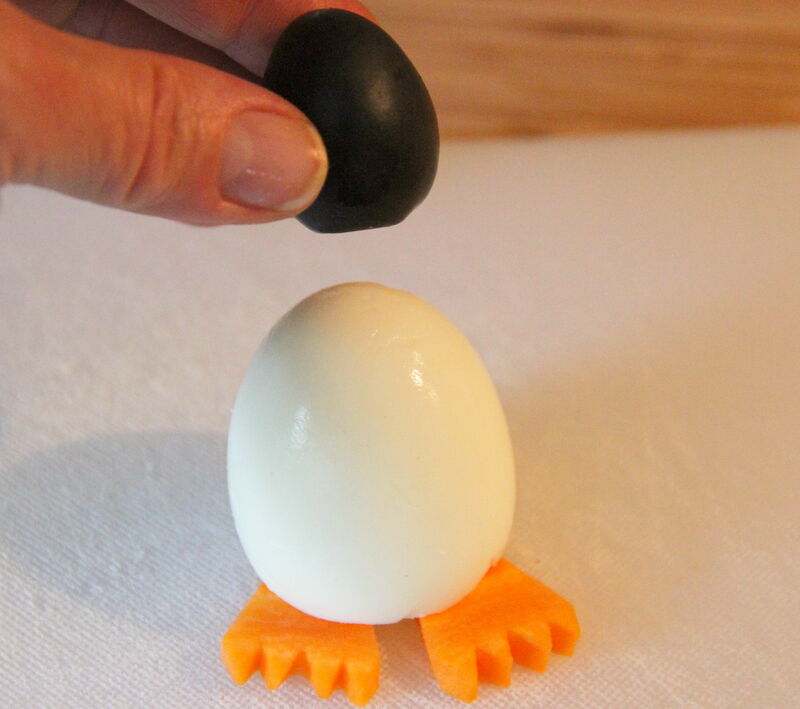 Tuck feet under standing eggs. Whittle 2 thin “beaks” from remaining carrot and set aside.